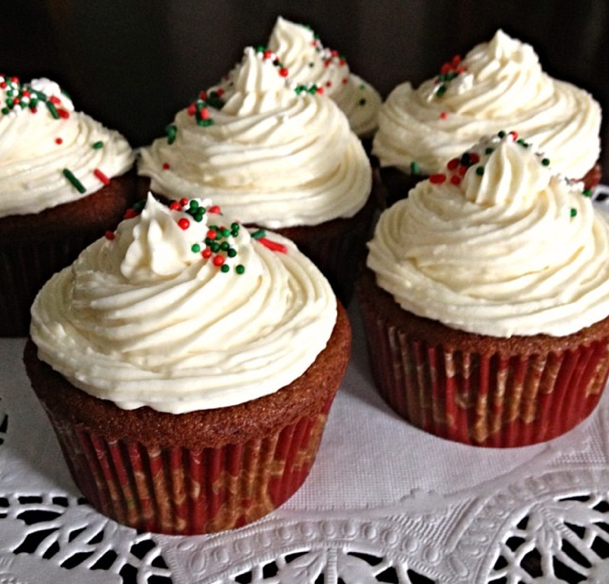 Gingerbread cupcakes with cream cheese frosting made an appearance on Abigail’s Instagram account over the holidays. The trunk of your car. Do you even know what’s in it? Maybe some random clothes that you’ve been too lazy to move for months, or a shovel for the endless mountains of snow in the tennis courts parking lot. I’m guessing that for most of us, stuff of little to no importance that just sits there. Well, I have a confession: The trunk of my car is pretty much full and I know exactly what’s in it. And it’s kind of weird: flour, sugar, cookie sheets, measuring cups, pretty much an entire assortment of baking items to make up the most basic (portable) kitchen. Despite the love for academia and sports that brought me to this institution in the first place, really one of my greatest passions in life is baking — sweets, treats, desserts, you name it. Some of you may know this already. At various times last semester, lucky late-night Frost dwellers received special deliveries of hot muffins, cupcakes, blondies and cookies. The act of baking fulfills me and gives me a feeling of purpose. At the same time, nothing brings me more satisfaction than sharing my baked goods with others. Because honestly that’s what it’s about: finding that thing, your thing that drives you and sharing it. When I arrived on campus with a car at school for my sophomore year, I knew that I had to use this new vehicle of mobility to find a way to bake. And that’s when the trunk of my car became a small, portable kitchen. Every so often on one of those days, those need a pick-me-up days, I head to Stop and Shop, grab what I need and head to Newport. Newport Dormitory is off of Route 9 and has a tiny kitchen that I take over. I awkwardly do NOT live in Newport. Regardless, I lug in multiple armloads of bowls and pans and butter while kids walk through the basement just trying to do their laundry in peace. To the Residents of Newport: I’m sorry that my taste in music is questionable and is not in Spanish or French but I blare it anyways. The sink is always full of dishes; there are crumbs on most surfaces, poor lighting and a number of other first world problems that might discourage the faint of heart. But by the time I have music going, the oven preheating (aside: I may possibly be getting slowing poisoned from the carbon monoxide…), and begin breaking down the new recipe I am trying, it’s all worth it. Despite the inconvenience and extensive process that is required to make a batch of Nutella Stuffed Pumpkin Brown Butter Chocolate Chip Muffins, they are as good as the ridiculously long title implies. On a day when everything just seems off or overwhelming, this is my fix. And since my baked goods don’t usually last very long, I take pictures of them too. Do you have an Instagram? Follow me at @gailsbakedgoods. #shamelessselfpromotion. I take pictures of the new foods I bake and post them, most often with captions that are so corny I think they’re funny and my friends get to roll their eyes. Even though I give most of my sweets away, I don’t actually do it for anyone else. Eventually I may start a bakery, blog or cookbook, but for now, I’m just doing what I love. For now, I am spending my beer money on chocolate chips and brown sugar and filling up the memory space on my phone with different shots of cookies because it makes me happy. What are you doing that you love, that calms you, or makes you feel whole? It doesn’t matter if seems weird or lame. Hey, I’m not judging you, and chances are that nobody else is. Everyone has something, or at least I hope you do, and if not yet, you will. Pursuing our passions and interests is what going to Amherst is all about. I hope everyone takes advantage of what we have going on here. It’s so easy to complain about it. Don’t we all remember the far too active Facebook nonsense, Amherst Rants or Complaints or whatever. Sometimes you have to reach out and do it for yourself. I know having cocoa powder and a spatula in my car is kind of unconventional but I like what I’ve got going. I like my routine. So go and follow your passion and if you like baked goods: take your phone out of your pocket and go follow me on Instagram! Do what you need to be a happier and more fulfilled person because it’s infectious. We are a campus of super interesting people, let’s lean into what we like despite the fact that it may not always be cool (says who) or easy (worth it anyways). And if you feel like a freak, remember that there’s a girl listening to Broadway tunes in Newport basement who practically has a bakery set up in her car. Abigail, I live in N. Amherst....graduate of Hampshire, where I was baking during my college years as well. Check out Bakepedia.com and drop me a line. Might be interesting for you to do a guest blog. And I have a kitchen:) You could come bake here. We need more Abigail's in the world! Way to go Abigail! Any chance you'll share your chocolate chip cookie recipe with me?